SHE IS BY LEFTON, JAPAN and the model number is 70565. Detail on base "70565 JAPAN". FOR SALE IS AN OLD LADY HEAD VASE FROM THE 1950s. Head/ Face - is lovely. Size approx 13.5 cm tall x 12 cm wide (hat) x 12 cm (front to back - hat). HAS THE MADE IN JAPAN PAPER STAMP. BELIEVE TO BE FROM THE 60S, NICE WHITE AND BLUE COLOUR. BELIEVE TO BE FROM THE 60S, NICE DARK CHARCOAL COLOUR WITHE RED AND WHITE FEATURECOLOURS. BELIEVE TO BE FROM THE 60S, NICE COLOURS WITH PALE BLUE FEATURECOLOUR. This stunning lady head vase was made by the Morimura brothers in Japan. The back stamp dates her to around 1910. Condition is very good. HALL Vase. Pattern Same On Each Of 4 Sides. Gold Leaf. Made in Japan. An unused gift. 28cm high 10cm wide. As such I am not an expert in all things antique but I do try to describe things to the best of my knowledge. Has foil label on base – Made in Japan. 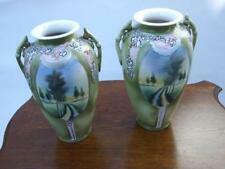 2 round vases. 8cm tall x 6.5cm diameter 1 squareish vases. 8.5cm tall x 7cm squared Always displayed in China cabinet No cracks glue or pieces missing Smoke free Pet free home. Please see other items listed. Lovely bird vase presents nicely, no faults. Very well cared for, been stored in china cabinet. Made in Japan as you can see from the base lable. This was a carnival prize from the 50’s and 60’s. My grandmother used to work at the Royal Adelaide Show before I was born and we had quite a few carnival items from the time around our family home. Gold swan pictured in last photo also available separately. 32cm tall Letting go of some memories. Anique Oriental Handmade Chinese Satsuma vase with lid only one for sale size: 185mm x 85 mm. Collectable fine china oriental Saji vase Japan. In very good condition no chips, cracks or damage but there are few hairlines Black marks inside the tip of the vase (photo 10 ). Height 18.5cm. Rim 5cm. Base 4.2cm. SATSUMA Koshida pottery VASE. Japan - Signed. Miyako Handcrafted Porcelain Vase Imari Ware Japan. Base is stamped withMiyako, Handcrafted, Porcelain, Imari Ware Japan. Vases bamboo floral design is featured on each of the four sides of vase. Gorgeous detail with bamboo and floral pattern. Vintage Japanese Pottery Vase 25cm. Condition is Used. Sent with Australia Post Standard Service. This unusual vase is in good condition. There are no chips cracks or crazing. It has been hand painted and some areas are missing paint. It has made in Japan inscribed on the base. Not sure of its age. It seems to be pottery of some kind. Manufactured : KB Japan c 1960. For sale a superb porcelain vase decorated in the cloisonné style with birds and blossoms. The color appears black but has a yellow cast which makes it a very dark brown. Anique Oriental Handmade Chinese Satsuma vase only one for sale size: 154 mm x 70 mm. Delightful delicate applied slip material in dots and raised garlands applied to these 2 vases or amphorae vessels with distinctive 1920s feel to the shape and notably 4 handles. Lightweight vases. The motifs are typical and redolant of the arts and crafts era. Normal signs of wear consistent with age. Large Double Handled Vase Hand Painted Royal Nishiki Nippon Vase Hand Painted written in blue The vase measures 41cms high The vase has no chips or cracks, but there is loss of gold gilding around the neck and handles and some brown specks (under the glaze) particularly around one side of the neck. All in excellent condition. pick up Carnegie. Featuring a robust,hand painted design of stylised flowers in the Imari colour palette on a pure white porcelain body, with cobalt blue trim. There is a fine, shallow surface fault around the waist of the vase created during manufacture. This lovely little vase is decorated with pink flowers and birds, all highlighted in gold. The body of the vase is ribbed and has a narrow opening so you could use it as a bud vase but I think it is more a decorative piece. See all pictures. The Approx size is: 23cm tall, 5.5cm top, & 6cm base. Small bluey green bud vase, with made in Japan label to the base and standing around 10.5cms tall. I would kindly ask you to review all images in zoom for full quality/condition report I know you'll be very impressed, enjoy. A GENUINE ANTIQUE J apanese SATSUMA JUG. This gorgeous piece displays thefinely crazed faience body that typifies SATSUMA ceramics but the gilding has worn in several areas from the many years of use. Pair of Small Vintage Satsuma Raised Dragon Vases, 10 cm / 4" , Japan (6814) Description: ---Name: Pair of Vintage Satsuma Raised Dragon Bud Vases ---Made by: ? ---Made in: Japan ---Colour: Brown with white, gold, blue, red, ,green and yellow ---Age: guessing c1940's? ---Measurements: Approx 10 cm / 4" tall Condition of item: Some rubbing of the gold to the dragon's head and the top rim. Otherwise bright and beautiful. There are no makers marks on these vases. Please see pictures as part of description. Vintage Chokin Vase ~ Gorgeous Australian Koala design ~ Great Condition! Vase is an off white colour with a Gorgeous Australian Koala design on the front. In great condition! Anique Oriental Handmade Japanese Satsuma Porcelain Vase the only one for sale ON LINEone for sale size: 95 mm x 60 mm. HAND PAINTED JAPANESE STUDIO ART POTTERY VASE. FROM AN ESTATE COLLECTION OF JAPANESE CERAMICS.